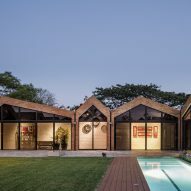 A series of gabled, brickwork volumes arranged around a grassy courtyard form this house in Guayaquil, Ecuador, designed by Chilean firm Felipe Assadi Arquitectos. Casa El Cortijo is a one-storey residence in Guayaquil, Ecuador, a port city known for its accessibility to the Galapagos Islands. 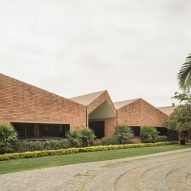 Felipe Assadi Arquitectos constructed the house as a series of volumes that are almost entirely made of bricks – including the pitched rooftops that create numerous peaks. 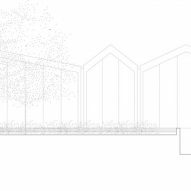 The segmented arrangement is used to divide up the functions of the residence. 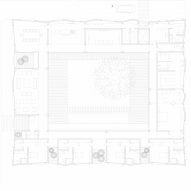 "The divisions between adjacent domestic spaces are marked by separate rooftops and projections on the continuous facade," said the firm, which likens the layout to a miniature version of Guayaquil. "Thus, they can be read as independent units belonging to a single system," it added. "Exactly like in the centre of the city." "The typology reflects the configuration on a different scale, of a typical city block in central Guayaquil, with back-to-back constructions occupying the perimeter and generating patios on the interior," it added. 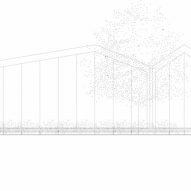 The volumes are joined together in four different sections that form a square around a large grassy courtyard, patio and swimming pool. Glass walls with gabled tops front each the volumes to offer views into this outdoor space. 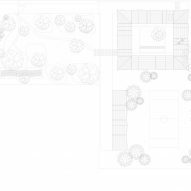 "The spaces of the house are articulated around a square central patio," said the studio. 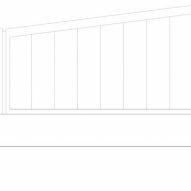 "The patio connects all of the spaces visually and ensures that the house has a landscape of its own." 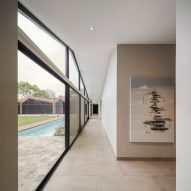 Among the functions of the house are four bedrooms that are accessed from a hall running along the length of the pool. Each bedroom includes an en-suite bathroom and access to a private, covered patio. Next to this sleeping section is a spacious living room, while the portion opposite of the bedrooms comprises a dining room, kitchen and storage area. Also in this section, is a small bedroom and bath. The fourth and final wing accommodates a large master bedroom with a lounge, a walk-in closet, and a bathroom with a double sink. 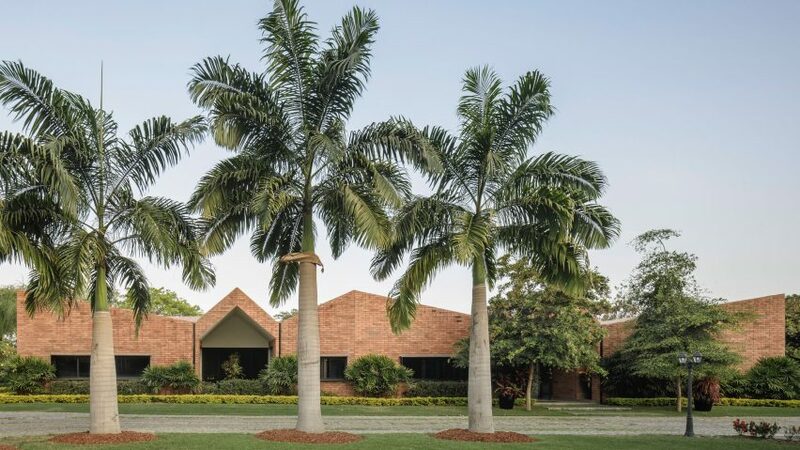 "If we were to remove the divisions, we would have a single continuous building with a large inner patio," said the firm. Guayaquil is about seven hours drive south from Ecuador's capital, Quito. Recent proposals by the city include BIG's IQON skyscraper, which is set to be the city's tallest building, as well as Safdie Architects' staggered Qorner tower – both of which have notable green designs. In addition to Casa El Cortijo, other houses in Ecuador are a bow-tie shape house on the coast by Emilio López, a renovated home with lofted beds by Al Borde, and a flat-roofed, two-storey residence by Gabriel Rivera. Felipe Assadi Arquitectos, which is based in Chilean city Las Condes, has designed many houses in South America, most of which are located in its home country. These include a coastal house with a look-out point on its roof, a bright red cabin in the mountains, and a linear concrete house with a protruding pool. Photography is by Fernando Alda.